Eight years before we get to know Cotton Malone, he lost his brother-in-law, Scott, to drowning while Scott was diving in Haiti. The circumstances of this drowning were routinely handled by the authorities in Haiti and if it were not for Cotton’s wife (her sister was married to Scott) insisting that Cotton take a closer look at the situation, everything might have been forgotten as soon as Scott was put in the ground. While in Scott’s apartment (looking for clues), Cotton is surprised by two men also looking for clues. He hides from them but learns that Scott may have been deeply involved in something shady. Travelling to Haiti, Cotton digs deeper and with some help from a boat owner he finds tantalizing evidence of something potentially VERY interesting. As soon as Mossad comes into the picture….you know Scott was in WAY over his con-man head. Thus his death. 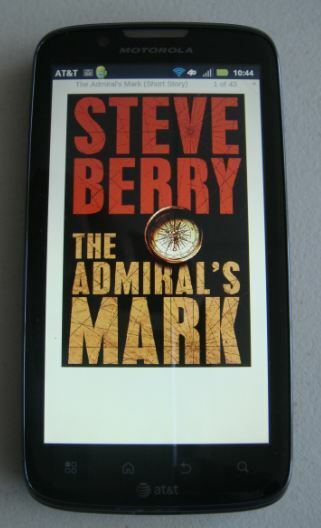 I read this short story entirely on my Motorola smartphone using the Nook app. I must say, I’ve never read any of his short stories. Is this a build up to the Cotton series? I did hear an interview with him last week on the Book Report radio show. He spoke quite a bit about his new stand alone book-The Columbus Affair-and they played an excerpt from the audiobook. Sounds like it’s gonna be a goodie! If you’re interested in getting an idea of what it’s like, you can find the archived show on their site(bookreportradio(dot)com) Also has the schedule and book lineup for the next show. Thanks for the review…think I’ll grab a quick read!